A mosque is a place where Muslims worship. The word mosque comes from the Arabic word masjid. A mosque may be small, and privately owned. A larger, 'collective', mosque is called a masjid jāmi. Larger mosques offer more services to their community. For many Muslim people, a mosque is more than a place of worship. Muslims worship, study and discuss Islam, and do many other things in a mosque and its compounds. In the United Kingdom, many mosques are used as community centres. They are also used to teach about Islam. Religious festivals and gatherings are held in mosques. Weddings are one example. Mosques have rules to control what people do inside. One of these rules is that it is considered rude to disturb another person who is worshipping. Many mosques are known for their Islamic architecture. The earliest mosques, opened in 7th century were open-air spaces. They are the Quba Mosque and Masjid al-Nabawi. Later mosques were buildings that were specially designed. Nowadays, mosques are in every continent, except Antarctica. The Jami Ul Alfar mosque in Colombo, Sri Lanka, has striking Moorish and Colonial architecture with a candy-striped facade. Many mosques are famous works of architecture. They are often built in a style that has stayed the same for many centuries. Many mosques have prayer halls, domes, and minarets. They may also have a courtyard. Mosques were first built on the Arabian Peninsula. The Muslims who built them used old architectural styles. They also combined these styles in new ways. A major influence was the palaces built during the Parthian and Sassanid dynasties of Persia. The Sarvestan palace from the Sassanid era is a good example of this. It has an arched entrance and a central dome. These features already existed in Persia before Islam. After the Arab invasion of Persia, the new style, with its Sassanid influence, was used for the new Islamic world. Many forms of mosques have developed in different regions of the Islamic world. Important mosque types include the early Abbasid mosques, T-type mosques, and the central-dome mosques of Anatolia. In the 20th century, many countries that grew rich from oil paid for the building of many new mosques. The rulers of these countries often hired leading architects to design these mosques. They included non-Muslims. Many early mosques have a square or rectangular plan. They also have a prayer hall and an enclosed courtyard. This is known as Arab-plan. The first mosques of this type were built during the Umayyad Dynasty. The flat roof of the prayer hall was supported by columns. Many rows of columns were needed to support such roofs; this is called "hypostyle architecture". One of the most famous hypostyle mosques is the Mezquita de Córdoba in Spain. It is supported by over 850 columns. In the warm Mediterranean and Middle Eastern climates, the courtyard served to hold the large number of worshippers during Friday prayers. Often, hypostyle mosques have outer arcades. They allow the visitors to enjoy the shade. Arab-plan mosques were built mostly during the Umayyad and Abbasid dynasties. The Arab plan was very simple, which did not allow for much further development. This caused that style of mosque to fall out of favour. 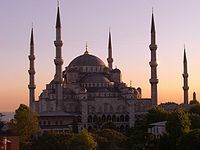 The Ottomans began building central dome mosques in the fifteenth century. These mosques have a large dome centered over the prayer hall. There may also be smaller domes, which are off-center over the prayer hall or the rest of the mosque. This style was heavily influenced by the Byzantine religious architecture with its use of large central domes. Iwan mosques are famous for their domed rooms and iwans. Iwans are spaces with an arched roof. They have an opening at one end. One or more iwans face a central courtyard that serves as the prayer hall. The style borrows from pre-Islamic Iranian architecture. Most mosques with this style are in Iran. The Great Mosque in Aleppo, Syria. The tower-like structure is the minaret. Most mosques have minarets. Minarets are tall towers. Usually they are at one of the corners of the mosque. The top of the minaret is the highest point in the mosque, and usually the highest point in the area around the mosque. The tallest minaret in the world is in the Hassan II Mosque in Casablanca, Morocco. The first mosques had no minarets. The most conservative Islamic groups, like Wahhabis, still avoid building minarets. They see them as simply a fancy decoration and unnecessary. The first minaret was built in 665 in Basra during the reign of the Umayyad caliph Muawiyah I. Muawiyah encouraged the building of minarets, as they were supposed to be the same as bell towers on Christian churches. Because of this, mosque architects used the shape of the bell tower for their minarets. Both the minaret and the bell tower serve the same purpose — to call the faithful to prayer. Before the five required daily prayers, a muezzin calls the worshippers to prayer from the minaret. In many countries like Singapore where Muslims are not the majority, mosques are stopped from loudly playing the call to prayer. The main problem is the use of electronic amplification of the call, which is now widely used by mosques. The domes were often placed directly above the main prayer hall. They represent the universe that Allah created. At first, these domes were small. They only took up a small part of the roof near the mihrab. Later, they took the whole roof above the prayer hall. Domes normally have the shape of a hemisphere. The Mughals in India popularized onion-shaped domes in South Asia and Persia. Some mosques have several domes, as well as the main large dome. The other domes are often smaller. Domes would help the imam be heard, as the sound waves would bounce in and then out of the dome making the voice louder. All mosques have a prayer hall, which is also called musalla. Normally, there is no furniture in it except for prayer mats or rugs. These are necessary, as Islamic prayer is usually done kneeling. Some mosques have Arabic calligraphy and Qur'anic verses on the walls to help worshipers focus on the beauty of Islam and its holiest book, the Qur'an, as well as for decoration. The qiblah wall is usually at the other side of the entrance to the prayer hall. This wall is specially decorated. In a properly sited mosque, it will be set perpendicular to a line leading to Mecca. People pray in rows parallel to the qiblah wall. They arrange themselves so they face Mecca. In the qiblah wall, usually at its center, is the mihrab, a niche or depression showing the direction of Mecca. The mihrab serves as the place where the imam leads the five daily prayers. A simple mosque in the Australian outback is different from the grand designs of older Islamic communities. Bourke cemetery, New South Wales. All people must wash themselves before they pray. Mosques often have fountains or other facilities for washing in their entrances or courtyards, so that people can perform the washing ritual before prayer. At very small mosques, worshippers may use restrooms for their ritual washing, or wu'du. In traditional mosques, there is often a building specially for washing. This is often in the center of the courtyard. In the prayer halls, people must not wear shoes for much the same reason. Modern mosques should appeal to the community they serve. For this reason, other facilities may also be available at the mosque, like health clinics, libraries, and a gymnasium. There may be decorative tiles, plaster or coloured mosaics on the walls. Adult Muslims are expected to pray five times a day. Most mosques have formal prayers for each of these times. If performing the prayer is difficult, for example for ill people, then exceptions are made. Mosques also hold a special prayer service, called jumuah. This is done once a week. It is a form of Sabbath and replaces the Friday prayers at the mosque. Daily prayers can be done anywhere. However, Muslims are expected to do their Friday prayer at the mosque. When a Muslim dies, a funeral prayer is normally held. It is held outdoors in a courtyard or square close to the mosque. The prayers have all the worshippers present, including the imam, taking part. During eclipses, mosques will host special prayers called eclipse prayers. There are two large holidays (Eids) in the Islamic calendar. During these days, there are special prayers at mosques in the morning. Larger mosques will normally hold them for their own communities as well as the people from smaller local mosques. Mosques, especially those in countries where Muslims are the majority, will also host Eid prayers outside in courtyards or town squares. There are many events in Ramadan, Islam's holiest month. During Ramadan, Muslims must fast during the day. Mosques organise iftar dinners after sunset. These are done after the fourth required prayer of the day. Part of the food is given by members of the community, which creates nightly potluck dinners. The community contribution to these dinners is required. For this reason, mosques with smaller communities may not be able to hold the iftar dinners daily. Some mosques will also hold meals in the morning before dawn. Mosques will often invite poorer members of the community to these meals. Islam sees giving charity during Ramadan as good acts. Larger mosques sometimes offer special, optional prayers. They are done after the last required prayer of the day. During each night of prayers, one member of the community who has memorized the entire Qur’an will recite a part of the book. It can last for up to two hours. Sometimes, several such people (not necessarily of the local community) take turns to do this. During the last ten days of Ramadan, larger mosques will host all-night programs to observe Laylat al-Qadr. It is the night Muslims believe that the Islamic prophet Muhammad first received Qur'anic revelations. On that night, between sunset and sunrise, mosques employ speakers to teach the worshipers about Islam. Mosques or the community usually provide meals at times through the night. The Al-‘Abbās Mosque in Karbala, Iraq is visited by millions of Shia pilgrims each year. During the late twentieth century, more and more mosques have been used for political purposes. Modern-day mosques in the Western world want to educate good citizens. The details differ greatly from mosque to mosque and from country to country. Countries with small Muslim populations use mosques as a way to support civic participation. They are more likely to do this than Muslim-majority countries of the Greater Middle East. American mosques host voter registration and civic participation drives. In the United States, Muslims are often immigrants, or the children of immigrants. Mosques want to interest these people for politics. They also want to keep them informed about issues that concern the Muslim community. People who attend the services at the mosque regularly are more likely to take part in protests, to sign petitions, and to involve themselves in political matters. A link between political views and mosque attendance can still be seen in other parts of the world. After the al-Askari Mosque bombing in February 2006, imams and other Islamic leaders used mosques and Friday prayers to call for calm and peace during the widespread violence. Beginning in the late twentieth century and continuing into the early twenty-first century, a small number of mosques have also become a base for extremist imams to support terrorism and extreme Islamic ideals. Finsbury Park Mosque in London is a mosque that has been used in this manner. Like other places of worship, mosques can be at the center of social conflicts. Babri Mosque was the centre of such a conflict up until the early 1990s when it was demolished. Before a solution could be found, the mosque was destroyed by about 200,000 Hindus. It took place on 6 December 1992. The mosque was built by Babur to mark the birthplace of Ram. It was believed to be on a site of an earlier Hindu temple. The conflict over the mosque was directly linked to rioting in Bombay (present-day Mumbai) as well as bombings in 1993 that killed 257 people. In February 2006, a bombing seriously damaged Iraq's al-Askari Mosque. This increased the existing tensions. The conflict between two Muslim groups in Iraq had already led to other bombings. However mosque bombings are not limited to Iraq. In June 2005, a suicide bomber killed at least 19 people at an Afghan mosque. In April 2006, there were two explosions at India's Jama Masjid. After the September 11 attacks, several American mosques were targets of attacks. These ranged from simple vandalism to arson. The Jewish Defense League was suspected of plotting to bomb the King Fahd Mosque in Culver City, California. There were similar attacks in the United Kingdom after the 7 July 2005 London bombings. Outside the Western world, in June 2001, the Hassan Bek Mosque was the target of attacks. The attacks involved hundreds of Israelis angry at Arabs for a previous attack. Saudi involvement in building mosques around the world only goes back to the 1960s. In the 1980s, the Saudi Arabian government began to pay for the building of mosques in countries around the world. An estimated US$45 billion has been spent by the Saudi Arabian government for mosques and Islamic schools in foreign countries. Ain al-Yaqeen, a Saudi newspaper, reported in 2002 that Saudi money may have helped to build as many as 1,500 mosques and 2,000 other Islamic centers. Saudi citizens have also given a lot of money to mosques in the Islamic world, especially in countries where they see Muslims as poor and oppressed. Following the fall of the Soviet Union, in 1992, mosques in Afghanistan received money from Saudi citizens. The King Fahd Mosque in Culver City, California and the Islamic Cultural Center of Italy in Rome are two of Saudi Arabia's largest investments in foreign mosques as former Saudi king Fahd bin Abdul Aziz al-Saud gave US$8 million and US$50 million to the two mosques, respectively. Baitul Mukarram (Dhaka), the National Mosque of Bangladesh The structure resembles the Kaaba in Mecca. In a mosque, people should keep focused on worshiping Allah. For this reason, there are a number of rules about the correct behaviour in a mosque. Some of these rules are the same all over the world, such as no shoes should be worn in the prayer hall. Other rules are different from mosque to mosque. It is generally seen as good to have someone who leads the prayers, though this is not strictly necessary. The person who usually leads the prayers is called imam. He must be a free and honest man. He should also be an authority when it comes to answering questions on religion. In mosques that were built or that are kept up by the government, the imam is selected by the ruler. In private mosques, the community selects the imam, through majority voting. Only men may lead prayers for men. Women are allowed to lead prayers for congregations where there are only women. In addition to washing, there are other rules that also apply to those who enter the mosque, even if they do not wish to pray there. It is forbidden to wear shoes in the carpeted area of the prayer hall. Some mosques also do not allow wearing shoes in other parts, even though these may not be devoted to praying. Islam requires that its believers wear clothes that show modesty. As a result, both men and women must follow this rule when they attend a mosque (though mosques may not always enforce the rules). Men are supposed to come to the mosque wearing loose and clean clothes that do not show the shape of the body. Similarly, women who come to the mosque are expected to wear loose clothing, shirts, pants that cover to the wrists and ankles and cover their heads such as with a hijab. Many Muslims, regardless of their ethnic background, wear Middle eastern clothing associated with Arabic Islam to special occasions and prayers at mosques. Mosques are places of worship. For this reason, those inside the mosque should be respectful to those who are praying. Loud talking or discussion of topics that could be disrespectful, is forbidden in areas where people are praying. It is also considered as rude to walk in front of Muslims in prayer or otherwise disturb them. Islamic law requires men and women to be separated in the prayer hall. Ideally, women should pray behind men. Muhammad said, women should pray at home, not at the mosque. Muhammad thought women should not be forbidden in mosques. The second caliph Umar at one time stopped women from attending mosques, especially at night, because he feared they may be teased by males, so he made them to pray at home. Sometimes a special part of the mosque was railed off for women; for example, the governor of Mecca in 870 had ropes tied between the columns to make a separate place for women. Many mosques today will put the women behind a barrier or partition or in another room. Mosques in South and Southeast Asia put men and women in separate rooms, as the divisions were built into them centuries ago. In nearly two-thirds of American mosques, women pray behind partitions or in separate areas, not in the main prayer hall; some mosques do not admit women at all. Although there are sections only for women and children, the Grand Mosque in Mecca is desegregated. A few scholars of Islamic law believe that non-Muslims may be allowed into mosques, as long as they do not sleep or eat there. Followers of the Maliki school of Islamic jurisprudence disagree. They say that non-Muslims may not be allowed into mosques at all. Different countries have different opinions on the question. Nearly all the mosques in the Arabian Peninsula as well as Morocco do not allow non-Muslims. The Hassan II Mosque in Casablanca is one of only two mosques in Morocco currently open to non-Muslims. In modern-day Saudi Arabia, the Grand Mosque and all of Mecca are open only to Muslims. Likewise, the Masjid al-Nabawi and the city of Medina that surrounds it are also off-limits to those who do not practice Islam. For mosques in other areas, it has most commonly been taken that non-Muslims may only enter mosques if granted permission to do so by Muslims and if they have a proper reason. In modern Turkey non-Muslim tourists are allowed to enter any mosque, but must obey the rules of decorum. Visiting a mosque is allowed only between prayers; visitors must wear long trousers and take off their shoes; women must cover their heads; no photos; no loud talk is allowed. No references to other religions are allowed (no crosses on necklaces, no cross gestures etc.). However, there are also many other places in the west as well as the Islamic world where non-Muslims are welcome to enter mosques. Most mosques in the United States, for example, report receiving non-Muslim visitors every month. Many Mosques throughout the United States welcome non-Muslims as a sign of openness to the rest of the community and to encourage conversions to Islam. Dogs are usually banned from entering mosques, but on 24 September 2008, the Muslim Law Council UK made special ruling, called a fatwa, which granted a blind Muslim permission to take his guide dog into the mosque. It is common for a smaller mosque to serve as a hostel for Muslims on haj (pilgrimage to Mecca). Sometimes mosques are used for refugees, or as temporary homes for homeless people. Obligations to neighbours in Islam are very strict, and specific. In the Qur'an Mohammed said that a person who helps others in the hour of need, and who helps the oppressed; that person God will help on the Day of Travail (agony). There are other commands, such as helping the poor and being nice to people. An important part of being Muslim, or just being part of the mosque, is taking care of people who need help. A mosque is a social, as well as a religious, group. A madrassa is a little different from a mosque. A madrassa focuses on teaching Islam, usually to children and young people. The Mezquita de Córdoba was a mosque. Today, it is the cathedral of Cordoba. When Spain was under Muslim control, some of the most beautiful buildings were mosques. After 1492, Spain was under Christian control. However, the Christians did not tear down the mosques. They simply put a crucifix in them to make them into churches. These mosques influenced the Renaissance architecture (way of building) in Europe. ↑ GCSE Religious Studies: Complete Revision and Practice (Revised ed.). Coordination Group Publications. 2009. p. 96. ISBN 9781847624062 . ↑ Arabic: مساجد جامع, masjid jāmi‘. ↑ 4.0 4.1 4.2 4.3 Hillenbrand, R "Masdjid. I. In the central Islamic lands". Encyclopaedia of Islam Online. Ed. P.J. Bearman, Th. Bianquis, C.E. Bosworth, E. van Donzel and W.P. Heinrichs. Brill Academic Publishers. ISSN 1573-3912. ↑ 5.0 5.1 "Religious Architecture and Islamic Cultures". Massachusetts Institute of Technology. http://web.mit.edu/4.614/www/handout02.html. Retrieved 2006-04-09. ↑ "Vocabulary of Islamic Architecture". Massachusetts Institute of Technology. http://ocw.mit.edu/OcwWeb/Architecture/4-614Religious-Architecture-and-Islamic-CulturesFall2002/LectureNotes/detail/vocab-islam.htm#islam6. Retrieved 2006-04-09. ↑ Walters, Brian (May 17, 2004). "The Prophet's People". Call to Prayer: My Travels in Spain, Portugal and Morocco. Virtualbookworm Publishing. pp. 14. ISBN 1-58939-592-1 . "Its 210-meter minaret is the tallest in the world"
↑ Hillenbrand, R "Manara, Manar". Encyclopaedia of Islam Online. Ed. P.J. Bearman, Th. Bianquis, C.E. Bosworth, E. van Donzel and W.P. Heinrichs. Brill Academic Publishers. ISSN 1573-3912. ↑ Mainzer, Klaus (June 1, 1996). "Art and Architecture". Symmetries of Nature: A Handbook for Philosophy of Nature and Science. pp. 124. ISBN 3-11-012990-6 . "the dome arching over the believers like the spherical dome of the sky"
↑ Asher, Catherine B. (1992). "Aurangzeb and the Islamization of the Mughal style". Architecture of Mughal India. Cambridge University Press. pp. 256. ISBN 0-521-26728-5 . ↑ 11.0 11.1 11.2 11.3 11.4 11.5 Maqsood, Ruqaiyyah Waris (2003-04-22). Teach Yourself Islam (2nd edition ed.). Chicago: McGraw-Hill. pp. 57–8, 72–5, 112–120. ISBN 0-07-141963-2 . ↑ Bierman, Irene A. (1998-12-16). Writing Signs: Fatimid Public Text. University of California Press. pp. 150. ISBN 0-520-20802-1 . ↑ "Terms 1: Mosque". University of Tokyo Institute of Oriental Culture. http://www.ioc.u-tokyo.ac.jp/~islamarc/WebPage1/htm_eng/index/keyword1_e.htm. Retrieved 2006-04-09. ↑ "Dress and Behaviour Code for the Sheikh Zayed Mosque". Abu Dhabi Tourism Authority. http://www.abudhabitourism.ae/en/info/sheikh.zayed.mosque.aspx. ↑ "Praying in shoes in a mosque where there are carpets". http://www.islamqa.com/en/ref/69793. ↑ "Fiqh-us-Sunnah, Volume 4: Funeral Prayers (Salatul Janazah)". Compendium of Muslim Texts. University of Southern California. http://www.usc.edu/dept/MSA/law/fiqhussunnah/fus4_62.html. Retrieved 2006-04-16. ↑ "Eclipses". Compendium of Muslim Texts. University of Southern California. http://www.usc.edu/dept/MSA/fundamentals/hadithsunnah/bukhari/018.sbt.html. Retrieved 2006-04-16. ↑ "'Id Prayers (Salatul 'Idain)". Compendium of Muslim Texts. University of Southern California. http://www.usc.edu/dept/MSA/fundamentals/pillars/prayer/Eid-Prayers_1.html. Retrieved 2006-04-08. ↑ "Charity". Compendium of Muslim Texts. University of Southern California. http://www.usc.edu/dept/MSA/fundamentals/pillars/fasting/tajuddin/fast_51.html. Retrieved 2006-04-17. ↑ 20.0 20.1 Jamal, Amany. "The Role of Mosques in the civic and political incorporation of Muslim America". Teachers' College – Columbia University. http://www.tc.edu/muslim-nyc/research/projects/role%20of%20muslims.html. Retrieved 2006-04-22. ↑ Swanbrow, Diane (2005-06-23). "Study: Islam devotion not linked to terror". The University Record Online. http://www.umich.edu/~urecord/0405/Jun13_05/03.shtml. Retrieved 2007-02-24. ↑ "Friday prayer plea for Iraq calm". BBC. 2006-02-24. http://news.bbc.co.uk/1/hi/world/middle_east/4747886.stm. Retrieved 2006-04-23. ↑ Romey, Kristen M. (July/August 2004). "Flashpoint Ayodhya". Archaeology. http://www.archaeology.org/0407/abstracts/ayodhya.html. ↑ Aizenman, N.C. (2006-06-02). "Suicide Bomber Kills 20 in Afghan Mosque". The Washington Post. p. A16. http://www.washingtonpost.com/wp-dyn/content/article/2005/06/01/AR2005060100263.html. Retrieved 2006-04-23. ↑ "NYCMA Voices That Must Be Heard: Continued attacks on mosques and Muslim-owned businesses alarm Muslim Americans". www.indypressny.org. http://www.indypressny.org/nycma/voices/255/briefs/briefs_1/. Retrieved 2009-04-27. ↑ "JDL Chairman, Follower Accused of Plotting to Bomb Mosque, Congressman". Associated Press via FOX News. 2001-12-13. http://www.foxnews.com/story/0,2933,40693,00.html. Retrieved 2006-04-23. ↑ "Arafat orders immediate ceasefire". BBC. 2001-06-03. http://news.bbc.co.uk/1/hi/world/middle_east/1366719.stm. Retrieved 2006-04-23. ↑ Harris, John (2006-04-22). "Paranoia, poverty and wild rumours - a journey through BNP country". The Guardian. http://politics.guardian.co.uk/farright/story/0,,1758974,00.html. Retrieved 2006-05-28. ↑ Carlile, Jennifer (2006-05-25). "Italians fear mosque plans". MSNBC. http://www.msnbc.msn.com/id/12927212/. Retrieved 2006-05-28. ↑ 30.0 30.1 30.2 Ottoway, David B. (2004-08-19). "U.S. Eyes Money Trails of Saudi-Backed Charities". The Washington Post. p. A1. http://www.washingtonpost.com/ac2/wp-dyn/A13266-2004Aug18. Retrieved 2007-02-24. ↑ Kaplan, David E. (2003-12-15). "The Saudi Connection". U.S. News and World Report. http://www.usnews.com/usnews/news/articles/031215/15terror.htm. Retrieved 2006-04-17. ↑ "Islamic Center in Rome, Italy". King Fahd bin Abdul Aziz. http://www.kingfahdbinabdulaziz.com/main/m4506.htm. Retrieved 2006-04-17. ↑ 33.0 33.1 33.2 33.3 33.4 Abu al-Hasankok Ibn Muhammad Ibn Habib, Al-Mawardi (2000). The Ordinances of Government (Al-Ahkam al-Sultaniyya w’al-Wilayat al-Diniyya). Lebanon: Garnet Publishing. pp. 184. ISBN 1-85964-140-7 . ↑ Connecting Cultures, Inc.. "Building Cultural Competency: understanding Islam, Muslims, and Arab culture" (Doc). Connecting Cultures, Inc.. Retrieved on 12 July 2006. ↑ Doi, Abdur Rahman I.. "Women in Society". Compendium of Muslim Texts. University of Southern California. http://www.usc.edu/dept/MSA/humanrelations/womeninislam/womeninsociety.html#mosque. Retrieved 2006-04-15. ↑ Rezk, Rawya (2006-01-26). "Muslim women seek more equitable role in Mosques". The Columbia Journalist. http://www.columbiajournalist.org/rw1_dinges/2005/article.asp?subj=national&course=rw1_dinges&id=624. Retrieved 2006-04-09. ↑ "Morocco travel". CNN. http://edition.cnn.com/2003/TRAVEL/DESTINATIONS/02/25/morocco.travel.ap/index.html. Retrieved 2006-09-22. ↑ Goring, Rosemary (1997-05-01). Dictionary of Beliefs & Religions. Wordsworth Editions. ISBN 1-85326-354-0 . ↑ . "The Mosque in America: a national portrait" (PDF). Council on American-Islamic Relations. Retrieved on 17 April 2006. ↑ "Laptop link-up: A day at the mosque". BBC. 2005-12-05. http://news.bbc.co.uk/2/hi/uk_news/4511780.stm. Retrieved 2006-06-16. ↑ "BBC NEWS | England | Leicestershire | Ruling allows guide dog in mosque". News.bbc.co.uk. 24 September 2008. http://news.bbc.co.uk/1/hi/england/leicestershire/7633623.stm. Retrieved 2008-11-03. ↑ Al-Suhrawardy, Abdullah Al- Mamun. "The Sayings of Muhammad by Allama Sir Abdullah Al- Mamun Al-Suhrawardy". muslim-canada.org. http://muslim-canada.org/hadiths.html#Charity. Retrieved 2009-04-25. This page was last changed on 26 November 2014, at 15:02.